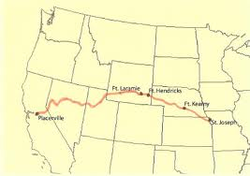 Most of the Forty-niners that were from the midwest or the east traveled on this trail. 32,000 gold-seekers traveled through present day Nebraska, Wyoming, Idaho, and Nevada. Travelng on ship was costly so many traveled by wagons pulled by oxes or mules, but very few came by horse. Countless were afraid of native Americans attacking them, but it rarely happened. the most cause of death was by diseases and sicknesses such as cholera, mountain fever, pneumonia, and diphtheria. 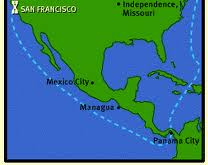 The Panama short cut made it quicker getting to California by cutting off 8,000 miles and a few months. the trip started off near the Chagres River off the Carribean Coastline. Forty-niners set sailed on a bungo, a panamanian canoe, and set out on mules or horses through a jungle once they landed. Mnay died from dieseases like Malaria, yellow fever and cholera.After going through the jungle reaching Panama City, though some never did, miners arrived at an outpost to take a boat ride to California. Those who have traveled this route did not enjoy traveling this way, by boat ,as costs ranged from one hundred to one thousand dollars. People had small rooms for up to eight months. The dangerous part of this route was the monstrous waves, frigid temperatures and high gusts of wind.This was probably the safest trip with thosands of men arriving safely to California.